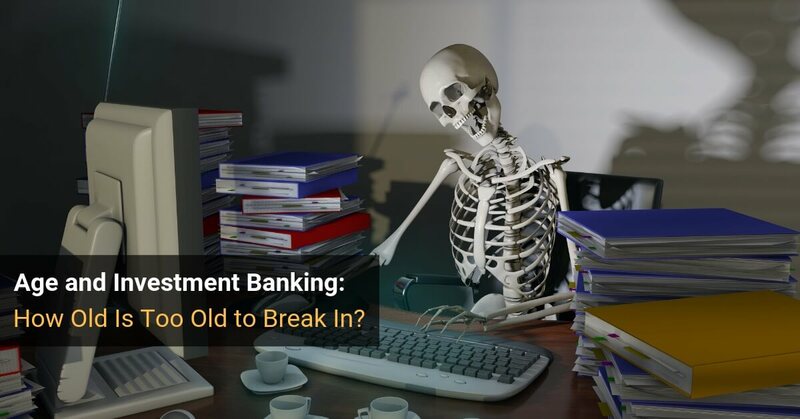 Age and Investment Banking: How Old Is Too Old to Break In? UPDATE: Please see the “Part 2” follow-up article to this one, on 6 ways to beat the odds and break into the industry as an older candidate. That article expands on what’s here and gives you tips and advice for what to do as an older candidate. There’s no issue more sensitive than age. Ok, maybe the CFA, GPA rounding, and Brazil come close. But I’ve gotten many panicked “How old is too old to break in?” questions over the years. The question “How old is too old to break into finance?” is a misguided one: in the US it’s not even legal to ask for your age when applying for jobs. Internationally, this is not true and in some countries they will ask for your age, photos, and other information that would result in lawsuits in the US. Still, most large banks are US-based and have standardized recruiting processes – so even if you apply in another region they’re not likely to ask explicitly how old you are. Which means that most of the time, banks cannot measure your age precisely. Instead, they assess your “age” by looking at how much full-time work experience you’ve had after graduating from university. Chances are that 10 years of full-time work experience makes you at least 30 – unless you were a child prodigy and graduated university at age 15, but then you wouldn’t be doing finance anyway. And when banks see those 10 years of experience they mentally switch into “Too old / experienced to be an analyst” mode. If you’re a recent graduate, you’ll be placed in the same category as everyone else – unless you have a really unusual situation (you started a business when you were 18, ran it for 10 years, then sold it and started college at age 28). The more full-time work experience you have, the harder it gets to break in at the entry-level. Yes, finance is the only industry where experience can actually count against you. This applies to both Analysts and Associates – it’s tough to do something else for a few years after business school and then move into banking. Full-time experience after university makes you “older” than full-time experience during or before university. So if you’re tempted to take a year off and become a ski bum or do volunteer work or anything else “full-time,” then taking a leave of absence from school and returning once you’re done is a better idea. This isn’t logical in the slightest, but nothing in finance is. In the FAQ I gave 30 as the upper limit for Analyst-level hires and 40 as the limit for Associate-level hires. Those were both under the assumption that you graduate around age 22-25. And those guidelines are mostly correct, but it’s not because of your age itself – it’s because of how much experience you’ll have by then. Analyst-Level: Banks rarely hire anyone at the Analyst level with more than 2-3 years of full-time experience. Associate-Level: If you’ve done an MBA banks usually want 3-5 years of experience but not more than 10. For Associates, it’s less about the years worked and more about the level you’ve attained. Someone at the mid-level could potentially come in as an Associate, but a top executive will not take a pay cut and start correcting spelling mistakes in pitch books 100 hours a week. Keep in mind that these are guidelines rather than absolute laws. I’ve seen relatively senior people join banks as Associates, despite having more than 10 years of experience – if you find the right group and tell the right story it’s doable. On the other hand, no, you will not be hired as an investment banking analyst if you are 50 and have 25 years of work experience. You won’t even get hired as an Associate with that kind of background. Yes, you can break in coming from very random backgrounds, but there’s a limit when it comes to years of work experience rather than the experience itself. And I agree with you – it’s silly to be this rigid. You can’t prioritize work above all else and be on-call 24/7. You won’t do whatever senior bankers ask you to without questioning orders. Concern#1 applies mostly to Associates. Banks assume that if you’re older you might have a family and actual responsibilities outside work, reducing your willingness to stay at the office until midnight all the time. Concern #2 applies to everyone – banks know that only less experienced hires are likely to follow instructions all the time without pushing back. This is why it’s difficult to break in if you’ve started a company or done something off the beaten path that required a lot of independent thought – you might not be able to follow orders. No, not everyone in the industry thinks like this. But it is a numbers game, and bankers want to maximize their chances of finding workhorse Analysts and Associates – so they target people in very specific categories. So What Do You Do If You’re “Too Old”? Pursue something like trading at a small prop trading firm where they care more about your results vs. your age or pedigree. If you’re too experienced to be an Analyst but not too old to be an Associate, a top business school is your best bet. If you’re already beyond business school or you’re in a very senior position at a company, think about Operating Partner-type roles at PE and VC firms. And if you’re frustrated with the rigidity, find a less structured industry. I have a bachelors in marketing. I recently got admitted into a french grande ecole – institut mines telecom. I am 29 now and have some experience in finance software & Business development. I am from India. I do speak basic french and am improving on it. What are my chances of breaking into french investment banking sector if I take the financial systems track ? “Associate-Level: If you’ve done an MBA banks usually want 3-5 years of experience but not more than 10.” Does this refer to pre-MBA experience, or post-MBA, or a combination? I am 50yrs old and had ran a retail and wholesale apparel operation in Japan for 15 years, but due to my love and passion for Finance, I am currently a senior at a university here in Missouri. Also I am planning to pursue an MBA in one of the top US schools and all in hopes to transition into Private Equity/Hedge fund/ IB. Please what is your advise? It’s going to be nearly impossible to move into IB/PE as an entry-level hire if you already have 20-30 years of work experience. Thank you so much for such an informative advice!! 2: Immediately focus the next 1-2 months towards studying/programs to gain a deeper understanding of the technicals necessary for where I want to be (Including mock interviews and additional modeling practice to improve efficiency), then begin the IB interviewing process again with a much more solid understanding of the information. Basically, the gap since graduation is growing quite significant. Would it be best to bite the bullet and accept a less relevant finance position to gain some real-world experience while I develop my technical skills further? Or will extending this gap in work even further to work on these skills for a month or two before returning to the recruiting process make me even less desirable in the eyes of an IB due to lack of work experience? I would go with option #1 because in all likelihood, part of the reason you are not doing well in interviews is because you are not currently employed. Bankers may try to spin it differently, but you always have a better chance of finding another job when you already have one job. So I don’t think you can attribute everything to a lack of technical knowledge. A lower GPA is also hurting your efforts, and you could offset that a bit if you were working full-time. Thanks for the article. I graduated with a BS in finance from a non-target school in U.S.then went straight for my MBA after that back to back. Now I have 1 year of commercial banking experience with a regional bank. While doing my MBA I had a private equity internship as well. What are my chances of breaking into the IB industry? The bank I work in does not have a IBD. Not very good because your story doesn’t match what banks want to see – you’re supposed to work for a few years first, and then do an MBA, and then apply to IB roles at the Associate level. You are going to get tons of questions about your story if you apply to IB roles right now. I would recommend first going to corporate banking (should be easier to get into coming from commercial banking) or an independent valuation firm or something like that and then aiming for IB roles at smaller firms. Otherwise, commercial banking to investment banking post-MBA is probably too big a leap. I’ve purchased your courses and I am very pleased so far. -Began career at a very small boutique M&A advisory (1-3 deal closings/year). Spent nearly 3 years at the firm, but working there was very unstable due to volume and non-bonus comp was significantly below average for IB. Here’s where things get a little messy…I left the CPA firm after nine months because I had the opportunity to co-found a fintech startup with a few friends. I spent 1.5 years on the startup and got a lot of experience while building my network. Unfortunately, the startup remained in a pre-revenue phase and we couldn’t get much traction (despite our efforts). While working on the startup, I came to the realization that IB was my true passion. I just really love working on deals. Obviously, I’ve spent a lot of time jumping around and getting a handle on what I really want to do, but after careful consideration, I’ve come up with a plan: I would like to re-enter the industry as an analyst with a regional M&A boutique. I want to spend 3-4 years at the analyst/associate level (33 y/o by the end of my tenure) and then move into a lower middle market P/E firm. My end goal is to start my own PE fund (around age 45-50). 1. How feasible is this plan? I realize my age is a little on the high end, but I feel that I’m young enough to where age still shouldn’t be a real issue. I recently spoke with an associate at a boutique IB and he expressed that my experience is in line with someone they would bring on as analyst. 2. Would you recommend that I get my MBA or CFA in the future? 1) I think the biggest problem is not your age, but the fact that you already have a good amount of full-time experience. Some boutique banks may not care about that, but others might not know where you should be in the hierarchy. You might also be perceived as a career changer due to the fintech experience. Your overall plan might work, but I still think it will be tough to win an entry-level Analyst role at boutiques, and moving from a boutique bank to a lower-MM PE firm is also challenging (see all the PE recruiting articles on this site… it requires an extreme amount of effort). 2) CFA, no, but the MBA might be useful if you cannot get into IB initially because people think you have too much work experience. Hello Brian, I’m new to this website. I’m now 21, studying finance in National Taiwan University (should be the best in Taiwan) and I’m now in the 4th year pursuing bachelor’s degree. I double major in law so I might extend my college life to 5, maybe 6 years. My overall GPA is 3.85/4.30. My concern is that if I’m finding a chance of IBD internships without relative experience, it might be pretty tough. Obviously I didn’t begin to prepare early enough (Especially my first and second year in the school) and tried some of the other fields. I had a summer internship in compliance division of a local bank and will on board in June for a 1-year PTA in McKinsey & Co. If I’m aiming for a 2019 summer investment banking or M&A intern, say Goldman, Morgan Stanley IBD or HSBC Global Banking(hk), is it possible(after all, it’s my 5th year as a college student and I’m kinda “older”)? What should I do or learn in advance? I think this really depends on where you want to apply for internships – North America? Europe? Taiwan? Hong Kong? Elsewhere in Asia? Recruiting is already over and done with for many 2019 summer roles in the U.S. because everything is hyper-accelerated, but it moves more slowly in other regions. The main issue for you isn’t age, but how far in advance you need to start recruiting. Well I’m open to opportunities in Greater China zone, while HK and Taiwan should be in the upper of the list. In Taiwan, 2019 vacancies should be available around this September till December. MS has a later schedule in 2019 March. The main concern is that I don’t think I’m fully prepared. I should dig into some cases and other online resources relating to modeling and valuation. I am a 30 year old. I recently completed my MSc in Maths, I am also completing the CQF. I have also been doing some data science through WorldQuant University and Am also doing an MScFE with WorldQuant. I have spent the past 5 years as a Teaching assistant at a University till recently. Currently I am a parttime lecturer. I wanted to pursue a Masters in Finance or a related field. Would that boost my chances of getting employed. I was looking at a 1 year MSc in Financial Engineering or Financial Maths. What are the odds I get a job in the financial sector. Most likely will complete the MSc when Am 32. Hi Brian. Thank you for this article. I am 29, currently a CFA Level 2 Candidate, After my undergrad in Commerce, I started my Accountancy course in India. I did my 3.5 years of internship (which apparently is not covered under Work Experience by Companies generally) as required by the Institute of Chartered Accountants of India, and yet to pass my Final 4 papers of the course. I had a work gap of a few years owing to a few personal issues followed by an accident and health issues. Just to get back to work, I started working with this company in the Compliance side, but not related to Finance or Investment Banking. I am interested in PE and Invesmtent Banking. Plus, I have lost years of employment which doesn’t look too good. What are your thoughts on it ? Thank you for this article, super helpful information. I graduated with a marketing degree and have 3 years work experience at the moment. I’m trying to figure out if I can still break in on the analyst level or if I need to wait to get an MBA and then break in at associate level. Any thoughts? You would probably need an MBA at this point because you have 3 years of work experience in a completely unrelated field. Hello Brian, thank you very much for your article. If you have time I would like to ask you to assess my possibilities of entering into one of the big names in IB. I recently turned 29, graduated as a mechanical engineer in Venezuela, did a masters in finance at one of Latin America’s top 10 business schools (4.0 GPA). Worked at Kraft Foods as a corporate finance trainee, then joined a multinational asset management firm (+1.5BN A.U.M) and became partner in less than 3 years. I feel I have peaked at this firm at a way too early stage of my life and I’m currently considering applying to a top MBA program (starting in the summer of 2019 when I’ll be 30 yo) and then testing my luck at one of the big names in IB in NYC. What do you think about my odds of getting in? If you can get into a top MBA program, you have a fairly good chance of winning an IB offer at a large bank. I’m 25 and about 2.5 years out of college, where I majored in finance and earned a 3.6 GPA. I attended a Pac12 school that boasted a decent business program but didn’t necessarily attract IB recruiters. So to bolster my resume I’ve worked in Fin sales since graduation and I’m currently a financial advisor at JPMC. I’m trying to break into an entry level IB analyst role hopefully within the next year or so. I spoke to one of our internal recruiters and he thought that my experience wouldnt measure up to some of the open IB Analsyt roles but I might be a better fit for the junior program which is meant for soon to be graduates or candidates with 3 years or less experience (applied to the junior program last week). I know I have the mind and skill set necessary for an IB role but I can’t help but get the feeling that my window of opportunity is closing. I’ve worked in fin sales roles out of college for the sole reason of blustering my resume to apply for an IB position but now I worry that I might be getting too old. Is my window of opportunity closing? Or was it never open to begin with? Yes, it gets harder to win IB roles the longer you’ve been out of school and working full-time. Your best bet at this stage is to go for the junior Analyst roles (they’re not the same as FT Analyst roles but can provide a pathway into it) or to attend a top Master’s in Finance program and use that to get in. Hi Brian, my teaching experience are in undergrad university level and originally my background is with a MS in Electrical engineering from the US. I see Columbia and New University feeding their students in highest number s in the IBs, but with experience in a different sector, how is that possible? Does the executive MBA in Columbia University help anyway to make careers in IBs starting from associate level? Please see my other response to your question. It is tough to just apply to MBA programs, accept admission, and win offers these days unless you have some other experience that looks quite relevant. Hey.. I am trying to apply for a good MBA school so that right after graduating, I can join any if the major investment banking firms as an associate? I have six years if teaching experience in applied science and engineering and 5 months of managerial experience in a small local investment firm, so is this possible? I did CFA level 1 and somewhat of level 2… I asked this to Cornell University 1 year MBA program, they said, it’s not possible from 1 year program to even get an internship as an associate. So what do you suggest to prepare myself from my country to get into MBA for an IB associate job? I just wanted to give my 2cents to this discussion. I am almost 27. I have no M&A or PE experience. However, right now I got 7 offers for M&A and PE jobs (no BB, but I have 0 experience and applied in Dez. for jobs starting in Januar to not loose time. Im still in the process for MS though). How did I get those jobs? Good universities were an asset. However, I broke into M&A and PE due to my character. I travelled over 1yr with a backpack, and was fighting professionally (thaiboxing). Recruters now have 100s of persons applying with the same generic CV. Try to prove that you are smart (with GMAT or comparables) and especially be different!! If you manage to become the Person that is more interesting than most of the others, thats as valuable as having the best grades from top universities and having the most work experience. Then age won’t matter (that much)..
Of course you need an interesting story to win these roles. No one is arguing with that. But there is still some point past which it will be very difficult to win entry-level offers at finance firms, regardless of how interesting you are. For example, you’re not going to win IB Analyst offers as a 40-year-old candidate even if you’ve climbed Mt. Everest, cured cancer multiple times, and also started your own traveling reggae group in the Caribbean. I’m a 27 year old junior majoring in finance (3.85 GPA) and graduating in Fall 2019 when I’m 29 years old. I have started school late for I joined the Air National Guard and have a deployment on my resume. Will age count against me? Also, when I was younger, I filed for bankruptcy. Will this make it impossible for me to get into investment banking or asset management? As long as you do not have prior full-time work experience, no. Thanks for the reply. If I go into real estate instead, do I have a chance of breaking into asset management when the bankruptcy is off my record (I will be 33 years old)? I also have the opportunity to commission to become an officer in the Air National Guard and work for them full-time and wait until my bankruptcy is up. Which do you recommend? Yes, potentially. I would not recommend waiting for your bankruptcy to be wiped away, as the better solution is to work at a smaller firm that does not care about those issues. -1.5y more in research (2.5 years total). I’ll study in my free time and finish at least the first level of CFA before I finish. Does that make sense? Is it possible? Will I be too old? Should I cut the research short to 1.5y total? What do you suggest? It’s possible, but if you have a PhD, you may be able to get into an early-stage life sciences VC firm without IB or an MBA first. So you might be spending a lot of time, effort, and money for little gain if that’s your goal. I’m 30 yo and have 6,5 years of capital markets experience in local boutique Investment banks in Brazil (structured finance / debt, front office role, participated on many big deals). My goal is to break into a Leveraged Finance (some overlap of knowledge with my prior experiences) team at an Investment Bank or boutique in NY or London. I’m planning to apply for an MBA next year (Schools in US and Europe). I can probably be accepted by a Top 5-20 School. Do you think it’s a good plan? Will I have good chances to break in Post-MBA? Does it worth to get an MBA in Europe, even with less MBA recruiting for IB roles? If you can get into a top school, yes, it is a good plan. There is relatively little MBA recruiting in Europe, so you’re better off going to the U.S. if you want to do that. I will be graduating from WP Carey Business School with 3.8- 4.0 GPA at the end of next year, Mutual Fund Club Member, and trying to network into a good internship next summer before I graduate in the Fall. I also have volunteer experience. Here is the kicker though – I didn’t start school till later. I will be 33 when I graduate. I absolutely love learning about investment banking and spend the majority of my FREE time learning more about the markets and tracking them. While the money is good, the real reason is I truly believe in the phrase “if you love what you do, you never work a day in your life”. So if I am too old what would you recommend? Do you have any idea if age issue is relevant only to US citizens or anyone? ??? Banks are global enterprises. The age issue is relevant for anyone who wants a client-facing, front-office role advising on M&A and financing deals at an investment bank anywhere in the world. I’m sorry, should have been clear. In US, it is illegal to discriminate a candidate based on his/her age. Is it applicable only to US citizens in US? Will a foreigner be discriminated because of his/her age in US? Banks will always discriminate based on age because you cannot do the job of an Investment Banking Analyst as a 65-year old; you just won’t have the energy and ability to pull all-nighters. They’ll just frame it differently and say that you have too much experience for an entry-level role or that you’re over-qualified. I am 31 years old, I want to enter the M & A market, private equity. I have taken several courses in financial modeling, valuation and now I am studying for CFA level 1. I have knowledge and skills but I want to put into practice. I have little experience in the field of finance what should I do? which paths should I do? Can I still work in this segment? maybe in small boutiques. Going to graduate from an Ivy League school in May 2018. Was an athlete all 4 years D1. Really would love to somehow get into a large financial institution and get hired in a rotating type situation. Have a great resume. Freaking out because I don’t know anyone on Wall Street. As of 2017, you need a sequence of internships to have a good shot of working at a large bank out of university (https://www.mergersandinquisitions.com/investment-banking-university-student-high-school-student/). So, if you don’t have that, your best option might be to go for something outside of IB (wealth management, etc.) or something at a Big 4 firm and then move over later. I’m currently a rising junior from a (prestigious) non-target liberal arts school that’s definitely not known for finance (it’s very “social justice” oriented), with a 3.7 GPA, majoring in Economics. I’m considering taking a gap-year for personal (health-related) issues, but I’m contemplating the potential benefits/drawbacks of doing so (in terms of full time recruiting for junior summer, etc.). If I took this “gap year” between sophomore/junior year, my goal would be to prep for IB and take accounting, learn how to model, etc. on my own. I had a finance related internship summer after freshman year (interned w/small RIA), but this summer I got a non-finance related role at a F500 insurance company (researching potential clients for Sales team). Would taking a personal gap year affect my eligibility on how I would look to banks for SA recruiting for summer before senior year (since I technically would be in school for five years, but attended for four)? I would really appreciate your thoughts — thanks for your help. Your biggest problem is that internship recruiting now (as of 2017) starts a year in advance of junior-year internships, at least at many banks and schools. So, taking a gap year at this point is probably your only shot at winning a summer internship – get an internship at a boutique IB/PE firm, change your graduation date, and then get to work networking so that you’re prepared to apply for internships 1 year before the internships begin. I appreciated for your response earlier. I’m concerned if BB/Elite Boutiques would reject my application automatically if they see that I had applied for two consecutive years with different graduation dates. I really appreciate your thoughts — thanks for your help. Recruiting is based on your current graduation date. Given the volume of applications to banks, they don’t track individuals unless you make it very far into the process and everyone remembers you. Hi Brian. I am law student (21) and I have made two bachelor courses in Finance and Economics in Germany. I am planning to apply for the Master in Finance in the Frankfurt School of Finance and Management and I would like to know your opinion if it is really worthy to make MoF or an MBA to break into investment banking and how is te environment in Frankfurt to get a job and if this Master is well-recognized over the world. I will have 40y old soon and have more than 10 years experience in financial markets (middle office in Europe). And have a master degree. Do you think it’s possible to switch into PE since i already have experience in financial market ? Also, i wanted to get an MBA at a top business school if that help. No, probably not. Think about other options such as working at a PE portfolio company, corporate development, corporate finance, etc. Thanks for your response Brian. The use of the term corporate finance varies between Europe and U.S. Does that include M&A (i would like to work in M&A actually). And last question, is it still possible to try an MBA or not worth it ? No, corporate finance is different and refers more to budgeting and planning. Corporate development is for M&A. I would not recommend an MBA at this stage because banks usually want candidates with less work experience. Thanks Brian, really appreciate your help. Plz keep up the good work ! I graduated in 2014 from a target UK undergraduate uni and tried to get into IB back then but did not get any offers (had quite a few interviews/assessment centres with bulge bracket banks for summer internships). So with no IB offers i ended up taking a job with one of the big 4 firms in tax. I have been working there for almost three years now and am close to complete the ACA (UK equivalent to CPA). I am thinking of giving IB recruitment another try and have applied and got an offer for a masters at a UK target uni with the intention to apply for IB summer internships/full time roles while doing the masters. I am just wondering if you think this is a good approach and would my 3 years spent in big 4 tax disadvantage me? Many thanks. Thanks Brian. So in this case would you recoomend going down the masters route or going to business school to do MBA instead? I would go for a Master’s degree. 3 years is borderline in terms of work experience, but it’s still almost always better to enter as an Analyst if you can do so (especially in Europe, where there’s less MBA-level recruiting). Hi Brian – I graduated from UC Berkeley back in 2011 (GPA 3.5 in biology) and did a lot of random stuff after. I volunteered a year abroad, traveled, and my only work experience is as a medical technician for 2 years. Basically I had no idea what I wanted to do with my life. It will be very tough to get into a formal IB role at this stage if you graduated 6 years ago. My advice would be to go for Big 4 roles, valuation roles, or corporate finance roles, and then think about an MBA or MSF and move into banking from there. I attended the military after high school, and attended a solid but non-target state school. I have been at a top restructuring/advisory firm for the last two years (promoted with excellent reviews), but would like to make the jump to to a Restructuring/Special Situations banking group. I am about to turn 30, so the natural fear of being too old has crept in. Thoughts? If one is used to working in an ambiguous environment with only a order of “just get it done by day xyz,” and thrives in that environment, then IB is not for him/her? ??? Not sure I understand. The point is that if you’re older/more experienced, bankers will assume that you won’t follow orders as blindly as a fresh graduate would. Spent 1 year as a prop trader after earning my bba in finace (series 57), 7 months as financial advisor (series 7, series 66, insurance license), then decided to go back to school for MBA. Finished mba in august while working in aerospace project finance 3 1/2 years. I left trading even though i loved because I am passionate about building relationships and working with people, left being an FA because it was entirely sales and no relationship building. I want to pursue IB because I love finance and have all my life, greatly enjoy analysis and can sit for days on end doing analysis, work with people and build relationships, and very interested in structuring transactions. Im approximately 30. MBA was a 1 year while in Aerospace at a non-target. Thoughts? I think it will be tough to get in if you already finished the MBA because banks mostly recruit from MBA students at top schools who are still in school. Maybe focus on smaller firms and see if you can gain traction there.